So I am planning to ride a mountain bike along the evocatively entitled Old Ghost Road. It runs from the now-defunct gold mining town called Lyell - in the upper part of the South Island - across the mountains to the West Coast town of Seddonville. Along the way, the track apparently passes through long-abandoned mining settlements, rugged mountain backcountry, dense primaeval forests, deep rocky gorges and large frothing rivers. In recent years the Old Ghost Road has been developed into a 2-3 day mountain biking route by the Mokihini-Lyell Backcountry Trust. It is an ambitious project in this remote and difficult terrain. Parts of the trail are apparently very challenging - the highest level grade five in some sections. A high level of fitness (big hills) and a reasonable level of mountain biking skill are apparently required. It sounds difficult, and if I am to go ahead with the ride, I need to consider if I am fully prepared. I am neither especially fit - sitting in front of the computer most of the time - nor do I have a massive amount of mountain biking experience. I’m not as young as I once was either. I would describe my bicycle skill level as moderate at best. Finally, my equipment is a bit limited; my trusty Kona is not a high tech full suspension fat tired monster, but instead, an average relatively inexpensive zip around town sort of mountain bike. It has 29’ wheels not well suited to sharp corners. But it is excellent for cruising down the long rolling hills. So, given these limitations and the dire warnings issued by the OId Ghost Road I thought I better test my abilities for the trail. To do this, I rode out from my home in Brooklyn Wellington for the local trails called Barking Emu and Red Rocks. While they don’t quite measure up to the hair-raising possibilities of the Old Ghost Road, they do include a big hill (getting to the start) and a few rocky and winding grade four downhills. I made a short film about the ride below. 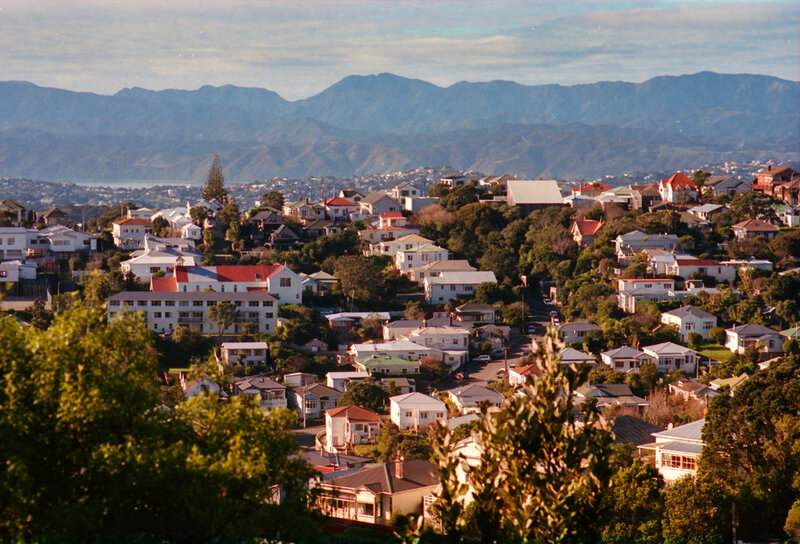 It is also in quite a scenic location, the rolling wellington hills providing sweeping views over the Wellington urban area and coastline. Photos shot on my Canon EOS-1 35mm film camera and a Sigma 85mm f1.4 and a 24mm f1.8. Film Kodak Portra 400. Canon EOS-1 35mm film camera, 24mm f1.8. Film Kodak Portra 400.